Hi everyone! Here's a quick and easy gift. I loooove hot chocolate and especially WITH marshmallows...gotta have it! 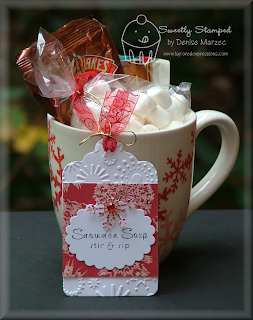 The mug is filled with a clear bag of mini marshmallows and two packets of hot cocoa mix. 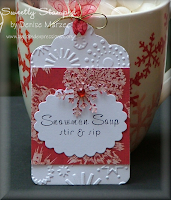 The Snowman Soup sentiment is from the new Tag Treats set. It was stamped in black ink and then cut out with a Nestabilities scallop oval die. The white tag was run through the cuttlebug with the snowflakes embossing folder. It was layered with the MME Be Merry DP from the new Christmas Key Ingredients pack and the die cut oval sentiment. I punched a snowflake out of the same Be Merry DP with my Martha Stewart snowflake punch, popped it up on foam tape over the sentiment, and added a red rhinestone to the center. Sarah asked where I found the snowflake mugs. Believe it or not, at my local grocery store (LOL! )...Redner's Warehouse Markets. How adorable is this?! And such a great, quick to finish gift...maybe for co-workers. Thanks so much for the inspiration. FABULOUS! Love this little ensemble. Denise: I must tell you, your blog is my favorite. The first one I look at every day. I love how it matches so well with the mug.. could you share where you found it ? Denise, this is sooooo yummy cute!! And yeesh ~ where have I been?? I didn't even realize this blog existed!! TFS!! Love this cute little gift idea Denise! YUMMY! This is way tooo cute - Denise!!! Super cute Denise!! Love the mug and the ingredients filling it up!! Your tag is fabulous!!! Wow! That tag looks great... so elegant with the dry embossing. TFS! Denise, this is absolutely adorable!